The S&C Research review service comes out on the first day of every month. Here is a preview of the March 2017 edition, which comes out on Wednesday. Each edition covers a wide range of exciting new research but this edition has a special theme of the Gluteus Maximus! Can cues increase gluteus maximus activation during the bodyweight glute bridge? The study: Hollman, J. H., Berling, T. A., Crum, E. O., Miller, K. M., Simmons, B. T., & Youdas, J. W. (2017). Do Verbal and Tactile Cueing Selectively Alter Gluteus Maximus and Hamstring Recruitment During a Supine Bridging Exercise in Active Females? A Randomized Controlled Trial. Journal of Sport Rehabilitation, 1. The researchers set out to discover whether verbal and tactile cues can alter gluteus maximus and hamstrings activation during a bridging exercise, in females allocated into either a cues group (CUES) or a no cues control group (CON). To do this, they measured gluteus maximus and hamstrings activation by electromyography (EMG) amplitudes, normalized to maximal voluntary isometric contraction (MVIC) levels. All subjects attended 2 testing sessions in which they did 5 reps of a bodyweight glute bridge exercise, holding each rep for 5 seconds at the top position. In the first session, both CUES and CON did the 5 reps without any cues. In the second session, CON did the 5 reps again without cues, while CUES received verbal and tactile cues intended to increase gluteus maximus activation and decrease hamstrings muscle activation. In CUES, 2 verbal cues were first provided: “squeeze your glutes” and extend your knees” followed by a combined verbal and tactile cue: the subjects were instructed to “push into my hands” where the investigator placed their hands on the outside edge of each knee joint, such that the subject would need to perform additional hip external rotation and abduction. Gluteus maximus activation was unchanged between the 2 testing sessions in CON. However, it increased from 16.8% to 33.0% of MVIC in CUES from session 1 to session 2. Hamstrings activation was unchanged between the 2 testing sessions in CON. However, it increased from 16.5% to 29.8% of MVIC in CUES from session 1 to session 2. This suggests that the verbal and tactile cues intended to increase gluteus maximus activation and decrease hamstrings activation actually increased both gluteus maximus and hamstrings activation. Does gluteus maximus activation training increase hip extension strength? The study: Cochrane, D. J., Harnett, M. C., & Pinfold, S. C. (2017). Does short-term gluteal activation enhance muscle performance? Research in Sports Medicine (Print), 1. The researchers set out to assess the long-term effects of a gluteus maximus activation training program on changes in gluteus maximus activation and force production during 1-leg hip extension, in male, semi-professional rugby players, randomly allocated to either a gluteus maximus activation training group (GLUTE), aged 20.9 ± 3.1 years or a control group (CON). 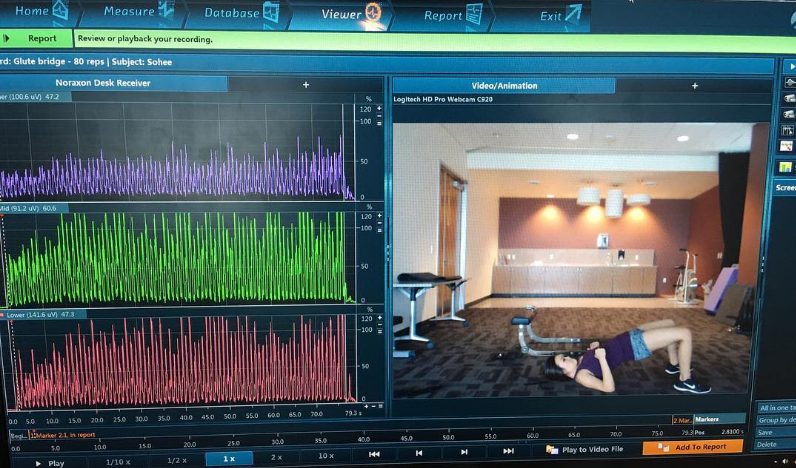 To achieve this, they measured gluteus maximus activation byelectromyography (EMG) using surface electrodes, normalized to levels in a maximum voluntary isometric contraction (MVIC) in a 1-leg isometric squat. They also measured dynamic 1-leg hip extension force by a force plate in a glute machine exercise. All subjects performed normal rugby training and normal strength training for 6 weeks. In addition, GLUTE performed a gluteus maximus activation training program 3 times per week. This training program included 7 bodyweight or resistance band exercises for the hip extensors or gluteus medius (including 1-leg Romanian deadlift variations without weight, band-resisted monster walks, and bodyweight glute bridge). GLUTE did not improve by more than CON over the 6 weeks for any measure. This suggests that the gluteus maximus activation training program was unable to increase gluteus maximus activation or hip extension strength when carried out in addition to a standard strength training program in rugby players. It is likely that exercises involving additional load are necessary to improve gluteus maximus strength and activation, such as the barbell hip thrust. Does the hip thrust produce greater gluteus maximus activation than the deadlift? The study: Andersen, V., Fimland, M. S., Mo, D. A., Iversen, V. M., Vederhus, T., Hellebø, L. R. R., & Saeterbakken, A. H. (2017). Electromyographic Comparison Of Barbell Deadlift, Hex Bar Deadlift And Hip Thrust Exercises: A Cross-Over Study. The Journal of Strength & Conditioning Research. The researchers set out to compare the muscle activation of the gluteus maximus, biceps femoris, and erector spinae muscles between the hip thrust, barbell deadlift, and hex bar deadlift exercises, in males with strength training experience. To achieve this, they measured gluteus maximus, biceps femoris, and erector spinae activation levels by electromyography (EMG) with surface electrodes, normalized to levels in a maximum voluntary isometric contraction (MVIC) during standard manual muscle testing. All subjects performed a 1RM hip thrust, barbell deadlift, and hex bar deadlift exercise (deadlifts were done with the same 72cm grip width, and the same foot width and rotation). Gluteus maximus activation was 16% higher in the hip thrust compared to the hex bar deadlift, and 8% higher in the hip thrust compared to the barbell deadlift. Biceps femoris activation was 28% higher in the barbell deadlift compared to the hex bar deadlift, and 20% higher in the barbell deadlift compared to the hip thrust. There were no differences between the exercises in respect of erector spinae activation. This suggests that the hip thrust produced the greatest gluteus maximus activation, while the barbell deadlift produced the greatest hamstrings activation. What is Glute activation training and can it be done at home. What exercises do you suggest for full gliute workout at home? Do you have a videos I can watch. hi bret, so i used to train glutes. whenever i contract my glutes as part of stretching my body(standing position, which is why glute contraction is naturally involved), i feel a slight crushing sensation on my coccyx. i’ll end up feeling a little pain on my coccyx the next day whenever i sit on a hard surface. this has happened before & take 1 week + to heal so no biggie i guess. but now it happens again which makes me wonder is this normal? have anyone else who train glutes experience this?